Residents around Vancouver’s False Creek have been shining green lights in their windows calling for the City of Vancouver and Concord Pacific to fulfill a decades-old contractual obligation to complete Creekside Park and the Seawall. Beachcombing, cycling, walking, or just quiet enjoyment and a fresh breath—parks and water access are hallmarks of our livable Vancouver. In 1990, in exchange for approval of 7,650 units of housing, Concord Pacific entered a contractual agreement with the City of Vancouver and the Province of British Columbia to deliver a 9.06 acre park on Lot #9, located at 88 Pacific Boulevard as part of a 42 acre park package for the new North False Creek neighbourhood These include Andy Livingstone Park, David Lam Park, George Wainbourne Park, Cooper’s Park and the Roundhouse Community Centre. The Creekside Park extension would complete that contractual obligation from 1990. To date, Concord Pacific has built and sold 11,511 units. Their new False Creek Central development, “one of the largest development phases anywhere in Vancouver,” adds a further 1,300 units to False Creek, with more to come if the viaducts are removed and with no increase in park space. Still, 29 years later, there is no permanent Creekside Park on Lot #9. Vancouver citizens expect developers to honour their commitments. It’s been 29 years—high time for the City to insist on Creekside Park before it grants any further permits to this developer. The viaducts can come down. This won’t interfere with the planned park site. Rezone the last development site, Lot 6C, and get on with the park development. False Creek, Mount Pleasant, Fairview Slopes, and the whole of Downtown is growing—young families, seniors, city enthusiasts—all active people who want to enjoy green space and fresh air. We all deserve easy access to our waterfront. False Creek is the gateway for all of East Vancouver, and is a key tourist destination for visitors. It’s an important gathering and celebration place, and all Canadians remember False Creek from coverage of Vancouver’s successful 2010 Olympics. Let’s make those memories special. We will continue our Green Light Campaign until the park is delivered. Contact us to get a green light for your window, then turn it on every night! Get a Creekside Park First Button for you and a neighbour. Contact the Mayor and Council to say that you do NOT want Carrall St moved to the east of the sales centre, which would allow more residential development and less useable park space. In 1990, in exchange for approval of 7,650 units of housing, Concord Pacific entered a contractual agreement with the City of Vancouver and the Province of British Columbia to deliver a 9.06-acre park on Lot #9, located at 88 Pacific Boulevard. Because it is zoned as a park, it was assessed at $1 so Concord doesn’t pay civic tax yet uses the public park space for a variety of commercial purposes, including special events and their “temporary” sales centre. To date, Concord Pacific has built and sold well over 11,000 units and have approval to build 1,300 more, which are almost complete. Creekside Park must be completed in order to balance this density—concrete buildings, new construction, the SkyTrain, major traffic thoroughfares, BC Place Stadium and Rogers Arena—and the livability of its citizens. Water access and parks are hallmarks of our livable Vancouver, but this area is one of the lowest tree-canopy-cover areas in the city. False Creek residents bathe downtown in a green glow as part on an attention-grabbing campaign calling for promised parkland. 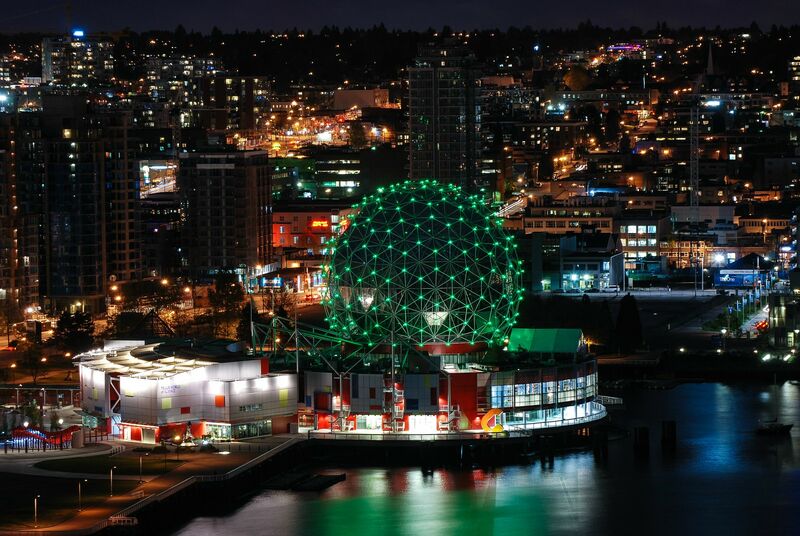 Ever wonder why those apartments in False Creek are displaying so many green lights? December 5, 2014—Listen to our interview with Katelin Owsianski on Making Contact at Evolution 107.9 in Burnaby. April 21, 2014—Telus World of Science supports the increasing livability and sustainability of our neighborhood. March 31, 2014—A look at the condos along the east side of False Creek taken from the Georgia Viaduct. March 14, 2014—False Creek residents displaying green lights in their windows to raise issue of the city of Vancouver to deliver on a long-promised urban park. March 10, 2014—False Creek residents are tired of waiting, so they’ve taken it upon themselves to green light a planned community park to stunning effect. Read more.. If you can’t make it to our next sales event, don’t hesitate to contact us. Also, the concierges at España and Europa have a supply of green light bulbs for sale. Ask for one at our next sales event, or don’t hesitate to contact us directly.